Genray - LED Lights - Fiber Group Inc. The Genaray LED-7100T 312 LED Variable-Color On-Camera Light features 312 LEDs that produce a very bright intensity, even if just at partial brightness. The max brightness is 1400 lux at 3 ft distance. The color temperature output is variable from a cool 5600K to a warm 3200K by a smooth-tuning dial on the back. The dial rotates steplessly with a bit of resistance that encourages fine-tuning. A magnetic diffuser snaps onto the front to soften the light output and significantly reduce contrast between different areas of your subject. Brightness is adjustable flicker-free from 10 to 100% by another stepless dial on the back. Flickering can be picked up by a camera, so the ability to adjust brightness flicker-free will enable you to lower or increase it while you’re capturing your scene. You get several accessories — two NP-F550 batteries that both attach onto the back and both provide power at the same time, an AC adapter for continuous power in an indoor setting, a dual-battery charger, a car charger, the above-mentioned snap-on diffuser, a ball head that swivels 360° and tilts 180°, and a carry case for keeping everything organized. Both the light and dual battery charger feature 4-light battery power indicators. The light has one indicator that shows how much power is left on both batteries combined or just one if you have only one attached, and the charger has an independent indicator for each battery. Alternative to the included batteries, you can attach any Sony L-series type batteries up to the largest and longest lasting ones. Like the AC adapter, the car charger can also be connected directly to the light to get continuous power without a battery. And the ball head features a shoe mount that comes off to reveal a 1/4″-20 thread for mounting and adjusting the light on various stands. 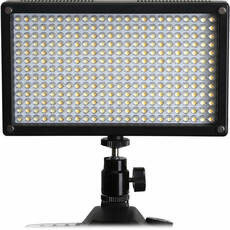 The 7100T has a densely solid build and is one of Genaray’s best Professional Series lights. Lux values vary greatly between manufacturers; different testing methods can produce varying results. Generay LEDs are metered in strict tests, aimed at producing accurate measurements. The amount that a thing weighs.